The Gundangara (also spelled Gundungara and Gundungurra) are an Indigenous Australian people in south-eastern New South Wales, Australia. Their traditional lands include present day Goulburn and the Southern Highlands. The ethnonym Gundangara combines lexical elements signifying both "east" and west'. The first attempt at a brief description of the Gundangara language was undertaken by R. H. Mathews in 1901. The language itself, now extinct, is classified as a subset of the Yuin-Kuric branch of the Pama-Nyungan language family, and is very close to Ngunnawal. The Gandangara lived throughout an area covering an estimated 11,000 square kilometres (4,100 sq mi) in the south-east region of New South Wales. According to Norman Tindale, their lands encompassed Goulburn and Berrima, running down the Nepean River (Wollondilly) until the vicinity of Camden. This includes the catchments of the Wollondilly and Coxs rivers, and some territory west of the Great Dividing Range. Their neighbours are the Dharug to their north, Darkinung, Wiradjuri Ngunawal and Thurrawal, (eastwards) peoples. In 1802, the explorer Francis Barrallier met the Gundungara people as his party moved through "The Cowpastures" southwest of Sydney, crossing the Nattai to the Wollondilly River and up to the heights above where Yerranderie now stands. Barrallier noted in his journal that the Gundungara "themselves build huts for the strangers they wish to receive as friends." Most of their land was initially not appetizing for early settlers, given the poor quality of the Nepean sandstone soils, and in a bid to stop encroachments they are said to have petitioned Governor King successfully in order to secure protected access to their riverine yam beds. This promise was maintained until King's departure in 1807. In 1811 Governor Macquarie started handing out numerous "land grants" to settlers in the Darawal area around Appin, one as large as 400 hectares (1,000 acres) given to William Broughton. In March 1814, some Aborigines were violently driven away after they complained of not being paid their wages for working for white settlers. In May an Aboriginal woman and three children were killed during skirmishes near the Milehouse and Butcher farms, and in retaliation, 3 Europeans were killed. Though this was on traditional Darawal lands, these fatal incidents, like a further one at Bringelly in June, were attributed to the Gandangara coming over from the west. The Gandangara joined forces with the Thurrawal/Darawal, who had linked up with remnants of the Dharug, in order to participate in the frontier war, also raiding cornfields. The decline in Dharug population had opened up parts of their territory to use by neighbouring tribal groups, which also fought among themselves. Aside from considerations of defending their territories against the European colonial expansion, a period of severe drought may have influenced this turn in strategy. Gandangara raiding bands, harvesting crops on settlers' properties, also attacked the Thurrawal and Dharug, so that the latter two began to collaborate against them, by helping the British authorities, and seeking refuge in squatters' settlements. Like other tribes, the Gandangara had developed strategies to cope with the superior firepower of musketry, teasing troops to fire at them, in the knowledge that, once fired, some time was required to reload them, during which the aborigines could launch spearing attacks. In 1816, 7 settlers, 4 on the Nepean and 3 at Macquarie's wife's property at Camden, were killed as the Gandangara came out of the hill lands in search of food. Macquarie ordered the 46th Regiment under Captain James Wallis to round up all Aborigines from the Hawkesbury down to the these southern areas. These punitive expeditions aimed to strike terror into anyone surviving them. Wallis often found settlers unwilling to hand over the Darawal people who lived on their stations, but eventually, executing what he later recalled was a "melancholy but necessary duty", tracked down a group camping under the Cataract River near Appin. According to the local historian Anne-Maree Whitaker, what followed on 17 April 1816 was a massacre. Hearing a child's cry and a barking dog in the bush, Wallis lined up his soldiers to search for the fugitives. In the moonlight they could see figures jumping across the rocky landscape. Some of the Aborigines were shot and others were driven off the cliffs into a steep gorge. At least fourteen were killed and the only survivors were two women and three children. Among those killed was a mountain chief Conibigal,[a] an old man called Balyin, a Dharawal man called Dunell, along with several women and children. In 1828, there was some interaction between the Surveyor-General, Thomas Mitchell, and the Gandangara, near Mittagong. Mitchell was supervising road construction. The Gandarangara are said to have composed a cheeky song about the building of the road (perhaps with appropriate mimicry): Road goes creaking long shoes, Road goes uncle and brother white man see. It must have seemed that building a road just to visit kin was unnecessary effort. Men from the Gandarangara also acted as guides for Mitchell at the time. Notwithstanding the attempts to disperse, round them up, or kill them under Macquarie's direction, the Gandangara population, able to take refuge in the tough hinterlands like the Burragorong, have sustained itself as an organized social group somewhat better than other neighbouring peoples like the Dharug, for in the 1860s they returned to demand restitution of their lands. Remnants of the Gandangara lived at Burragorang on the Wollondilly River, where they were interviewed in the early 1900s by the ethnographer R. H. Mathews, who took down some of their legendary lore. According to Gandangara belief, in the primordial dreamtime (gun-yung-ga-lung, "times far past"), two creator figures, Gurangatch, a rainbow serpent, and Mirragañ, a quoll, went on a journey from a point on the upper reaches of the Wollondilly River, with Mirragan pursuing the former, until the trek ended at a waterhole named Joolundoo on the Upper Fish River. The distance covered by this serpentine movement and the pursuit extended some 169 kilometres (105 mi) away. Much of this landscape with its minute Gandangara toponymic descriptions considered to be "one of the best documented Aboriginal cultural landscapes", was submerged with the construction of the Warragamba Dam after WW2. At that time animals were human, and collectively the animal people of that pristine world were known as Burringilling. The features of the landscape were etched as Gurangatch wriggled and slipped across and under the terrain, in flight from his predator, or sometimes while directly fighting with him. When Mirragañ caught up with his prey, he would flail away at him with a club (boodee), while Gurangatch would strike by thrashing his tormentor with a whipping from his tail. The site called Slippery Rock', but the native name is Wonggaree, known now as Slippery Rock marks a point where they engaged in struggle for a long time, wearing the rock down so smoothly that people slip on it every since. ^ This name is spelled variously in reports: Wallis calls him alternatively Kincabygal and Kinnabygal; Organ writes this as Carnimbeigle; recent reports from people claiming descent from him write Kannabi Byugal. ^ "Former Wollondilly state Labor MP Phil Costa confirmed that while he was in parliament he assisted with the transfer of the land believed to be location of the Appin massacre to the Aboriginal community." ^ a catchment area known to whites of the district as the "Rocky Waterhole". ^ Mathews 1901, pp. 140–148. ^ Koch 2004, pp. 21–22. ^ a b Smith 2009, p. 87. ^ a b Connor 2006, p. 37. ^ Smith 2009, p. 94. ^ a b c Goodall 2008, p. 31. ^ Whitaker 2005, pp. 6–8. ^ a b Whitaker 2005, p. 11. ^ Connor 2006, p. 46. ^ a b Connor 2006, pp. 47–48. ^ a b c d Organ 2016. ^ a b c Bertola 2015. ^ a b Whitaker 2005, p. 12. ^ Mathews 1908, p. 203. ^ Smith 2009, p. 93. ^ Smith 2009, pp. 87–88. ^ Smith 2009, p. 106. ^ a b Mathews 1908, pp. 203–206. ^ Mathews 1901, p. 142. ^ Smith 2009, pp. 88,89. ^ Smith 2009, p. 99. Bertola, Vera (2 February 2015). "Ancestors to rest in peace in their homeland of Appin". The Daily Telegraph. Connor, John (2006) [First published 2002]. The Australian Frontier Wars, 1788-1838. University of New South Wales Press. ISBN 978-0-868-40756-2. Goodall, Heather (2008). Invasion to Embassy: Land in Aboriginal Politics in New South Wales, 1770-1972. Sydney University Press. ISBN 978-1-920-89858-8. Grant, Stan (2016). The Australian Dream: Blood, History and Becoming. Quarterly Essay. Volume 64. Schwartz Publishing. ISBN 978-1-863-95889-9. Koch, Harold James (2004). "A Methodological History of Australian Linguistic Classification". In Bowern, Claire; Koch, Harold (eds.). Australian Languages: Classification and the Comparative Method. John Benjamins Publishing. pp. 17–59. ISBN 978-9-027-24761-2. Mathews, R. H. (December 1901). "The Gundungurra Language". Proceedings of the American Philosophical Society. 40 (167): 140–148. JSTOR 983755. Mathews, R. H. (1908). "Some Mythology of the Gundungurra Tribe, New South Wales Part 3". Zeitschrift für Ethnologie. 40: 203–206. Organ, Michael K. (2016). Appin Massacre and Governor Macquarie's War 1816. University of Wollongong. pp. 1–34. Smith, Jim (2009). "New insights into Gundungurra place naming" (PDF). In Koch, Harold (ed.). Aboriginal Placenames: Naming and Re-Naming the Australian Landscape. Australian National University. pp. 87–114. ISBN 978-1-921-66608-7. Tindale, Norman Barnett (1974). 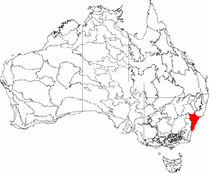 "Gandangara (NSW)". Aboriginal Tribes of Australia: Their Terrain, Environmental Controls, Distribution, Limits, and Proper Names. ANU Press. ISBN 978-0-708-10741-6. Tranter, David (2000). "Fragments of a Song - A Brief Search for Historical Truth". National Parks Association of NSW. Whitaker, Anne-Maree (2005). Appin: The Story of a Macquarie Town. Kingsclear Books. ISBN 978-0-908-27284-6.